Building an email marketing website ready for a free email marketing software bulk email delivery can be pretty easy using open source and free softwares like WordPress and SendBlaster Bulk Emailer Free edition. First step will be building a WordPress website and publishing your contents. 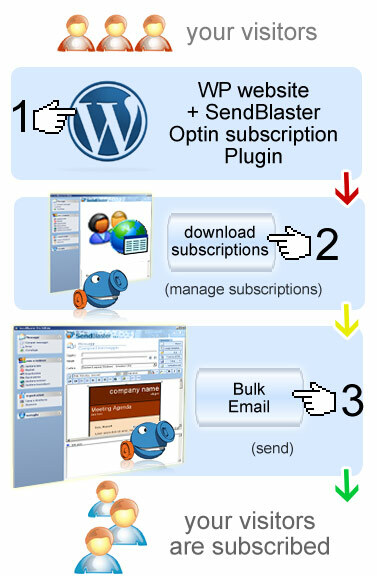 Before the first website public presentation you will configure the WordPress opt-in widget for newsletter subscription. While you write and publish your contents, as time goes by, new subscribers will join the mailing list. Please pay attention on the fact that these subscribers are people interested in your contents: they are waiting for your words and they trust your newsletters. You will soon build up a subscribed user-base mailing list of loyal and thirsty readers. Understanding the right timing for your emailings. Once a week, or once in a year? We are constantly overloaded by information, you will be the more successful in your business if you send only interesting mailings. We believe in quality: speak only when you've got something good to say. This will give you a credibility aura among your readers. Email marketing: the building process. WordPress email marketing is a fast way to hot start your website… while building the mailing list user-base will take some time. You find online many email-addresses sellers, they give you hundred of thousands of generic emails addresses of strangers… Analyze the effect of a word spoken from a stranger… and the response to a word spoken from someone you trust since a long time, someone who speaks your business' language. We should always give our readers the option to unsubscribe from our newsletter. Remember that Email marketing means keeping in contact with your customers… you will never get in contact with someone who dislikes or doesn't care about your words. mass email program: sending license for SendBlaster PRO bulk emailer program. Put your email address into > Mailbox for managing subscriptions. Here's how to export to CSV file your wordpress users and comments to a valid SendBlaster .CSV file.